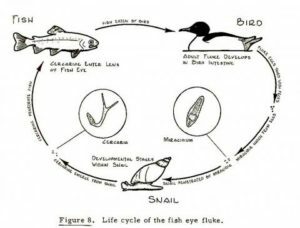 Researchers report that the common eye fluke can alter the anti-predator behaviour of its fish host in different ways depending upon whether it is immature or an encysted larvae that can infect a fish-eating bird. To escape from predators, animals deploy a variety of strategies, many of which make them less conspicuous. These range from various, sometimes very elaborate, forms of camouflage to behaviour patterns that help to avoid attracting attention and keep them out of danger. These strategies represent an obstacle for parasites that use these animals as intermediate hosts and need their current host to be eaten in order to pass onto their next host (known as trophic transmission). Some parasites have overcome this problem because their hosts limit, abandon or even reverse these predator-avoidance behaviours or cryptic body forms. One of the classic examples of this is that of rats infected with Toxoplasma gondi, a single celled parasite which, when encysted in the brain of rats, causes them to lose their fear of cats and even explore areas in an experimental arena where cat’s urine has been placed. Parasites of aquatic invertebrates such as shrimps have also been the subject of many studies of changes in host appearance and predator-avoidance behaviour. However, there is a caveat to the concept that a parasite may make its intermediate host more vulnerable to predation. Most parasites take some time to mature before they become infective to the next stage in the life cycle. If a host is eaten before this maturation is complete then no parasite transmission will occur. Thus increased host vulnerability to predation is only of benefit to a parasite once it is mature. Whilst this seems to be the case for many examples, a few investigations have shown that infection with immature stage parasites actually makes the host less vulnerable to predation, behaviour then switches when the parasite matures and the host is more vulnerable. A spiny-headed worm infection in shrimps is a good example. Mikhail Gopko and colleagues have been studying this issue using rainbow trout that have been infected with the common eye fluke, Diplostomum pseudospathaceum; a parasite well known for causing behavioural changes in its fish hosts. Adults of the common eye fluke inhabit the gut of fish- eating birds such as gulls. The eggs they produce pass out with the gull’s faeces and, if they are deposited in fresh water, hatch to release a small larval form called a miracidium. This stage is covered in cilia and swims to seek its next host, a fresh water snail (Lymnaea species). Here it multiplies asexually producing thousands of free swimming cercariae, the next larval stage in its life cycle. These cercariae are shed from the snail and, on encountering a fish they burrow through the skin and migrate to the eyes, an immunologically inert site. Here they encyst as a third larval form, the metacercaria, and lie dormant. 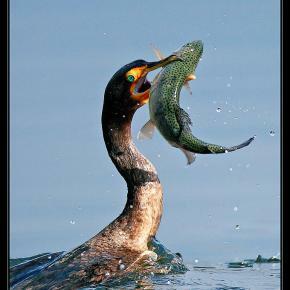 They will only develop further if the fish is consumed by a fish-eating bird. In 2015 Dr. Gopok’s group investigated the anti-predator response made by rainbow trout infected with immature larval stages of the common eye fluke. By simulating predation using a dip-net catch they found that, although the infected trout swam at the same depth as uninfected fish, infected trout were less active and less vulnerable to being caught. This suggested that, at this stage of infection, the parasites may actually be enhancing host protection from predation. In a recent report they describe further studies using both immature and adult larval eye flukes. They extended their observations to include recovery time after the “freezing” behaviour that occurs upon predator attack. Trout were infected with the cercariae that had been shed by snails (Lymnea stagnalis) and tests performed before and after the metacercariae had encysted in the fishes’ eyes. Cameras were used to record fish activity and the depth at which they swam and a stick was passed over the aquaria in which each fish was held to simulate the attack by an aerial predator. The latter initially produced a short bout of erratic activity followed by freezing. The time to recover from freezing was recorded. As predicted, fish harbouring mature parasites were more active and swam nearer the water surface than non-infected fish. In addition, fish with mature or a mixture of mature and immature larval parasites recovered more quickly from freezing. Interestingly, immature parasites were unable to change freezing behaviour one way or the other. The authors suggest infection with mature metacercariae changes trout personalities, making them bolder and resulting in them becoming more conspicuous and thus more likely to be predated by birds. They briefly air the parasite-manipulation verses “boring by-product of infection” (i.e. changes caused by pathology) hypotheses to explain these behavioural changes and come down in favour of the former, largely because the reversal of behaviour patterns as the eye flukes move from immature to mature larvae is unlikely to occur as a result of pathology. While the exact mechanism of how it happens is still unclear, the report provides an excellent case study of a trophically transmitted parasite manipulating the behaviour of its intermediate host in order to maximize its chances of getting into their definitive host, highlighting the complexity of these interactions.